FITNESS fans in Bingara will get a blast of cold air and a shower hit with news of a major funding boost delivered by Northern Tablelands MP Adam Marshall today. Mr Marshall announced a $63,985 State Government grant for the Bingara Sporting Club so its gymnasium and fitness centre can punch above its weight in the sweat-blasting stakes. 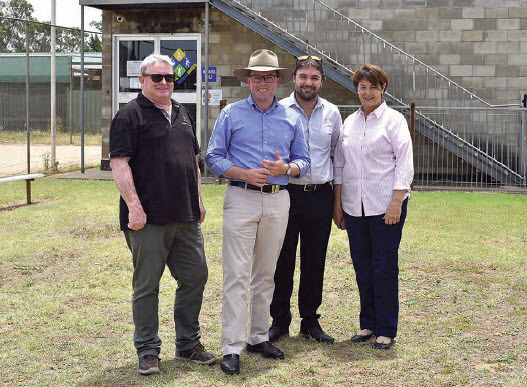 Gwydir Shire’s Community Development Manager, Tim Cox, left, Northern Tablelands MP Adam Marshall, Gwydir Shire Council’s Fitness Centres Coordinator Graham Cutmore and Deputy Mayor Catherine Egan outside the town’s gym and fitness centre. The fitness centre, operated jointly by Gwydir Shire Council and the club, will use the funding to provide men’s and women’s changerooms, showers and toilets indoors in the gym area. And those attacking the fat for a fitness hit will find they can do it in more air conditioned comfort from now on too. “Hot and sweaty might be the aim but having to achieve it in uncomfortable inside conditions will be a thing of the past for fitness fans at the centre from now on,” Mr Marshall said. Bingara Sporting Club President and former gym operator Tim Cox says the air-conditioning will be the first cab off the rank in the remodel-and-refurb project. “The air con will be in very soon we hope, the gym as good as it is; you can’t go in there this time of year because it’s just too hot,” Mr Cox said. Mr Marshall said the project would give the club showers for the first time but also provide internal change room amenities for gym users. “They will provide for 24-hour access for the gym users, which is a great outcome for a small club,” Mr Marshall said. “The Bingara Sporting Club is a volunteer-led organisation with about 550 members and there’s about 100 gym users who actively use the fitness centre, so putting in new, modern, fit-for-purpose changerooms will benefit so many people. “The whole project has come out of the strategic planning the club has done because it’s a bit of a community hub in Bingara; it’s a beautiful location right in the middle of town and on the river, and this is a great step forward. Mr Cox said the project would deliver a big bonus, with hopes the air-con will be fitted in the next month or so, and with some luck in getting their ducks in a row for sub-contractors and contractors for the building works, new amenities before summer ends. “It will be great and it will just finish off a marvelous facility,” Mr Cox said.